NEW! 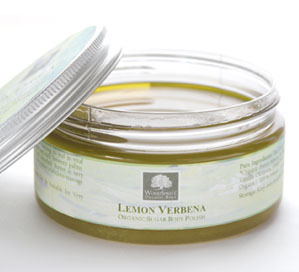 Buff your way to healthier, smoother skin with our vibrant Lemon Verbena Body Polish! Our fine Organic Raw Cane Sugar's gentle crystals contain natural glycolic acid, which dissolves away dulling dead skin cells, while Organic Grapeseed and Organic Sunflower Oils offer balanced moisture and nourishment for soft, glowing, silky-smooth skin. To Use: Mix well. While standing on a towel or sitting on edge of tub, scoop a handful of polish and massage onto dry torso, limbs, hands or feet in gentle, circular patterns. Applying to wet skin will diminish exfoliation. Shower or soak as usual, rinsing off with warm water. Pat skin dry with a towel--no need for additional moisturizers! Use once or twice weekly to maintain soft, smooth, vibrant skin. Pure Ingredients: *Organic Raw Cane Sugar, *Organic Sunflower Oil, *Organic Apricot Kernel Oil, *Organic Grapeseed Oil, *Organic Avocado Oil, Pure Essential Oils of *Organic Lemon, *Organic Lavender, Litsea Cubeba, Roman Chamomile & Ylang Ylang; *Organic Lemon Verbena, Full Spectrum Non-GMO Vitamin E, Rosemary Oleoresin. (*Certified Organic) 100% Natural.